Eventually, the Shadow will come to pass. The Army is looking for replacements to the venerable drone, first flown in 1991, through its Future Tactical UAS program. In the nearly three decades since, every aspect of drone technology has seen some improvement, including materials used, sensors to communication hardware and software, and even the batteries that power those computers and sensors. The Army has also seen the limitations of what it can and cannot do with a drone that has to either operate from a runway or be launched from a rail and caught on a hook. Into this mix of requirements and new possibility flies the Resolute Eagle, made by PAE ISR, complete with an ad hoc network system from Persistent Systems. The Army is looking at a range of drones for possible Shadow replacement, and the Resolute Eagle will have to compete with designs as varied as Insitu’s ScanEagle and Integrator and Martin UAV’s V-Bat. This is a somewhat crowded field, and to compete in it Resolute Eagle has a VTOL model, which essentially grafts booms with rotors to the drone’s wings, allowing it to take off and land like a quadcopter. 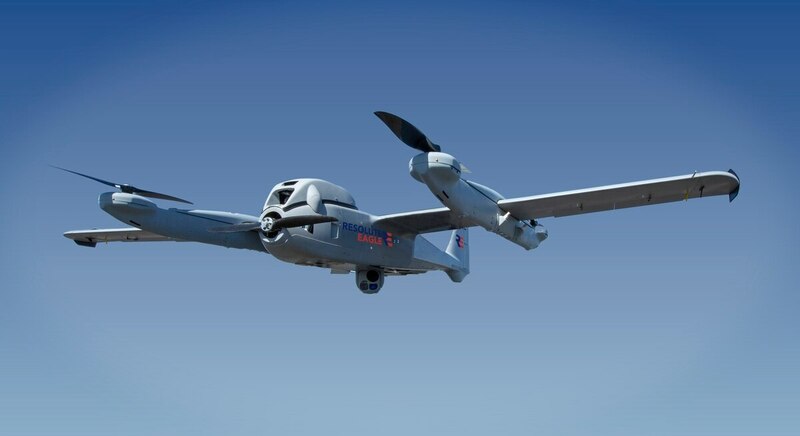 The VTOL configuration is listed as having 12 hours of endurance, compared to 18 hours for the purely fixed-wing version, and the booms are detachable, giving some flexibility when forward deployed. “Our reconfigurable platform (from fixed wing to VTOL), large payload capacity, and reduced ground support equipment requirements offers significant mission flexibility, both as a Shadow replacement for BCT expeditionary forces and as a complement to the existing platforms currently in use for military and civilian uses,” said Beth Beach, vice president of business development at PAE ISR. Besides military customers, PAE ISR is targeting the Resolute Eagle at a broad range of law enforcement, the Department of Homeland Security, humanitarian and commercial missions, according to Beach. Its ISR abilities could be used for pipeline and railway inspection, as well as evaluating the area after a natural disaster and looking for people in search and rescue. Key to this is an ability to operate beyond line of sight through satellite communications. Relying on satellites is a safe bet for civilian applications going forward, but across the Pentagon people are looking for other ways to retain or set up communications networks on the battlefield in the event that the satellite communication becomes untenable. One way to ensure communication via drones is equipping the drones with tools for an ad hoc network. For the Resolute Eagle, that comes in the form of Persistent Systems’ MPU5 Wave Relay mobile ad hoc networking (MANET). This MANET is platform agnostic, and could operate not just from Resolute Eagle drones, but from multiple drones, ground robots, and in systems carried by people on foot. To keep the communication secure, MPU5 radio operates with AES 256-bit Suite B encryption, ensuring that only those with the right decryption tools (or the proper key) can access it. As the Army looks for its Shadow replacement, the capabilities on offer are what’s most compelling, since they suggest the full range of possibility for a new mid-sized tactical drone. Crossing over from offering to contract is a not insignificant task, and in November 2018 US Naval Air System Command awarded PAE ISR a $1.73 billion contract for ISR services by Resolute Eagle.